Were you able to pick up the limited edition Mister Rogers' Neighborhood stamps when they went on sale at the post office back in April? These commemorative Mister Rogers' Neighborhood stamps were released to help celebrate 50 years of this beloved television. I made a point to pick up a set of the stamps to put away, as I loved this series growing up, and have loved sharing it with my girls, and love collecting special postage stamps like these. Feel old yet? I grew up watching this show with my brothers, and loved running off the school bus just to watch it. While I am not 50 years old yet, I am getting up there, and can appreciate this beautiful DVD collection, which features 30 classic episodes from 1979-2001 -- all of which I saw during my childhood, and have enjoyed watching again with my two girls recently. Thanks to streaming channels and PBS, I have been able to share Mister Rogers' Neighborhood with my girls. They first were introduced to this series back when they started watching Daniel Tiger's Neighborhood, which is based of the beloved Mister Rogers' Neighborhood. I wanted to show the girls the show I grew up on, and loved so much. There was something about Mister Rogers that made learning about things like recycling and taking care of our planet fun and enjoyable. I never walked away from watching an episode without learning something, and being reminded to be a good friend and neighbor. You couldn't help but love the Mister Rogers' Neighborhood show, and now as we celebrate 50 years of this beloved PBS show, parents from my generation can now share some of their favorite episodes they grew up watching and loved, with their children. In addition to the 30 memorable episodes, which will have you reminiscing about watching this show as child, this DVD collection also contains the series premiere episode which is in black and white. My girls are not used to watching black and white shows and when I played this episode, they thought something was wrong with the television. I couldn't help but laugh when they said this. I had to tell them that growing up I used to watch black and white shows with my family before we bought a color television, and that many of my favorite childhood movies were in black and white. 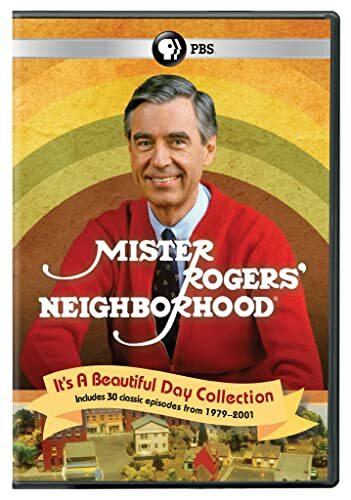 With over 14.5 hours of content filling 4- DVD discs, the new Mister Rogers' Neighborhood DVD collection is sure to delight kids and adults of all ages, as you welcome Mister Rogers back into your home for more make-believe fun and interesting field trips. We have only made it through two and half DVDs so far, but my girls are loving all the wonderful educational and fun content that we have seen. And, I love seeing them get excited about learning and wanting to be a bigger part of their community, thanks to this beloved show. "This special set of 32 memorable episodes and over 15 hours of content celebrates the 50th anniversary of the beloved Mister Rogers' Neighborhood, the pioneering children's television series from The Fred Rogers Company. Mister Rogers helps children learn the importance of being kind to others, appreciating what makes everyone unique, recycling and taking care of our planet, and much more in the classic series. The new release also includes a very special bonus episode - the series premiere, in original black-and-white! "MISTER ROGERS' NEIGHBORHOOD: IT'S A BEAUTIFUL DAY COLLECTION" is now available on DVD and Digital. The four-disc collection has a total run time of 928 minutes. Episodes of the program are also available for digital download. Through his popular daily TV visits, generations of young children have grown up with the kind and gentle Mister Rogers, who created a calm and safe place that welcomed all to his neighborhood. With real-life guests, adventurous field trips and charming make-believe segments, the iconic Mister Rogers' Neighborhood encouraged kids ages 2-5 to learn about themselves and the world around them, speaking directly to the series' young audience with his unique one-to-one affirmation of their self-worth. Celebrity guest stars have included: Tony Bennett, Julia Child, Margaret Hamilton, Michael Keaton, Yo-Yo Ma, Wynton Marsalis, Rita Moreno, and Bill Nye. " About The Fred Rogers CompanyThe Company was founded by Fred Rogers in 1971 as the non-profit producer of Mister Rogers' Neighborhood for PBS. In the years that followed, it not only created hundreds of episodes of this much-loved program, but also extended Fred's values and approach to other efforts in promoting children's social, emotional, and behavioral health and supporting parents, caregivers, teachers, and other professionals in their work with children. The Fred Rogers Company continues to build on Fred's legacy in innovative ways through a wide variety of media, and engaging new generations of children and families with his timeless wisdom. The company's highly-rated, award-winning children's series include Daniel Tiger's Neighborhood, Peg + Cat and Odd Squad. For more information, visit www.fredrogers.org or follow us on Facebook and Twitter. PBS KIDS, the number one educational media brand for kids, offers children ages 2-8 the opportunity to explore new ideas and new worlds through television, digital media and community-based programs. PBS KIDS and local stations across the country support the entire ecosystem in which children learn, including their teachers, parents and community. Provided by stations, the free PBS KIDS 24/7 channel and live stream is available to nearly 95% of U.S. TV households. Kidscreen- and Webby Award-winning pbskids.org provides engaging interactive content, including digital games and streaming video. PBS KIDS offers mobile apps to help support young children's learning, including the PBS KIDS Video app, which is available on a variety of mobile devices and on platforms such as Roku, Apple TV, Amazon Fire TV, Android TV and Chromecast. PBS KIDS also offers parent and teacher resources to support children's learning anytime and anywhere. For more information on PBS KIDS content and initiatives supporting school readiness and more, visit pbs.org/pressroom, or follow PBS KIDS on Twitter, Facebook and Instagram.